32 MMS November 2017 mmsonline.com RAPID TRAVERSE Machining Technology in Brief Scanning for Speedier Setups BY BA R BA R A S CH U L Z on the platform of a CNC machine tool. GE turned to another user of an Ambit-equipped machine for aid. The blades and the material-addition NC program were sent to this other user for the 3D-printing operation. The chance for this kind of redundancy is a strength of a hybrid process in production, Mr. Jones says. Full production at greater scales would involve multiple hybrid machine tools, allowing work to be routed through these sepa- rate machines as needed. Then again, Hähnle drew a lesson from the crash that offers an even more straightforward option for ensuring the hybrid machine's capabil- it y. In production, he says, it's prudent to be prepared with a spare cladding head. R enishaw's Supascan on-machine scanning probe offers an alternative to touch-trigger probing for faster workpiece setup and par t measurement. At rapid feed rates (G0), the system acquires a vast quantity of surface and position data within seconds, the company says. The probe is the newest addition to Renishaw's Sprint system for high-speed, high-accuracy, in-process control applications. 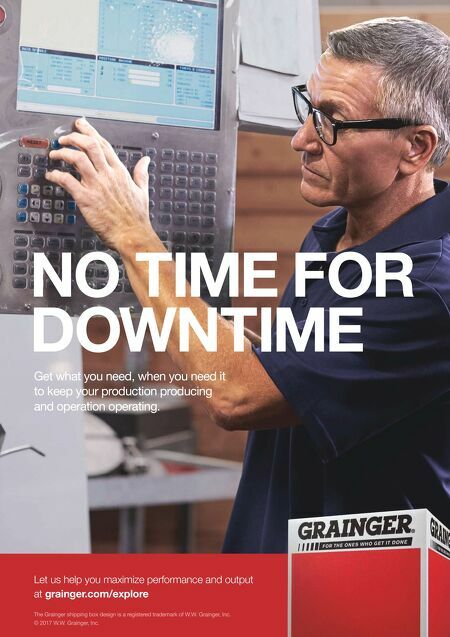 For many years, on-machine scanning probes have been used for advanced measurement applications that include complex-par t-setup tasks, and while scanning provides great speed benefits on most types of workpieces, the pro- gramming and data processing requirements can require significant overhead in some cases. Supas- can is designed for simple machine-tool integra- tion to enable fast workpiece setup that maximizes spindle uptime. 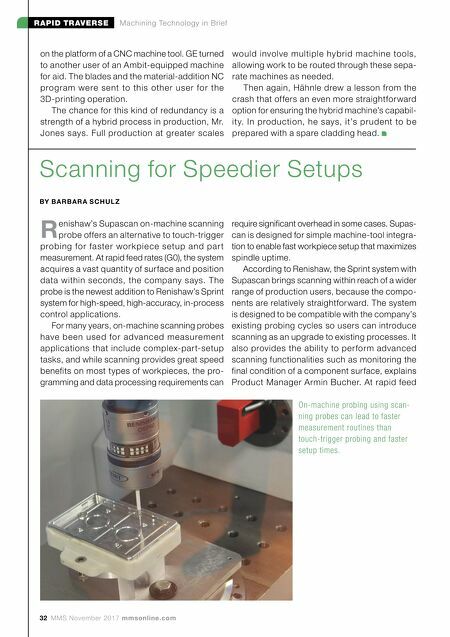 According to Renishaw, the Sprint system with Supascan brings scanning within reach of a wider range of production users, because the compo- nents are relatively straightforward. The system is designed to be compatible with the company's existing probing cycles so users can introduce scanning as an upgrade to existing processes. It also provides the ability to per form advanced scanning functionalities such as monitoring the final condition of a component surface, explains Product Manager Armin Bucher. At rapid feed On-machine probing using scan- ning probes can lead to faster measurement routines than touch-trigger probing and faster setup times.